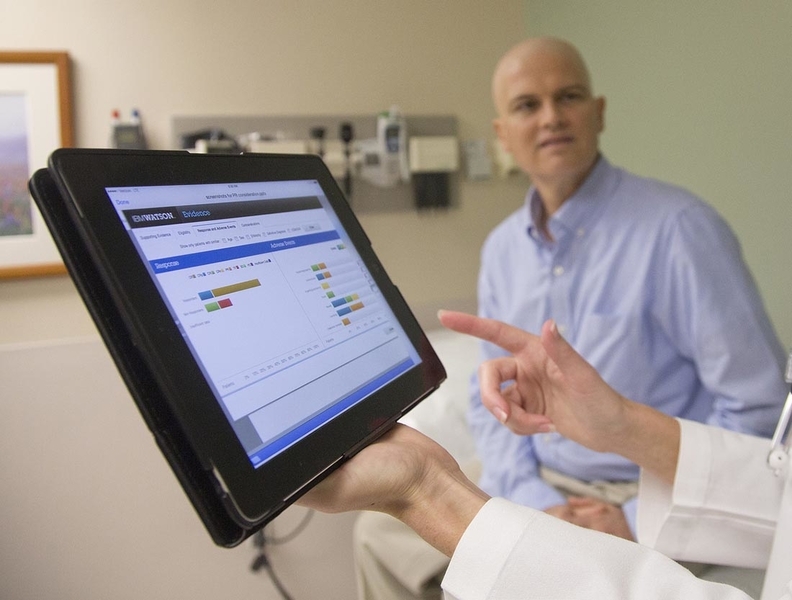 IBM Watson is working with MD Anderson physicians to develop and fine-tune treatment plans, match patients with clinical trials and recognize adverse effects. Computer giant IBM is paying $2.6 billion to buy Truven Health Analytics to bolster the healthcare capabilities of its Watson cognitive computing system. The company says the deal will bring in more than 8,500 clients, according to a press release. Those Truven clients include hospitals, clinicians, health plans, employers, life science companies, and state and federal government agencies. Data brought over from the deal will also swell IBM's existing health-record data set to about 300 million patient lives, the company said. “Data is important,” said healthcare information-technology industry veteran Todd Cozzens, managing partner at Leerink Capital Partners, an asset-management affiliate of investment bank Leerink Partners, which specializes in healthcare. Cozzens said the Holy Grail is matching claims data with clinical data. That allows for analysis of the reasons for patients' admissions, as well as their co-morbidities and care outcomes. That information has traditionally come only from Truven, Health Catalyst, Cerner Corp. or Epic Systems Corp.
“It's a race for who can come up with the most valuable data. That is the future of healthcare—what are the most effective drugs, care paths and what combination of therapies works best,” Cozzens said. The deal for privately held Truven Health will be IBM's fourth health-related acquisition since launching its Watson Health cloud-computing platform last April. Watson uses machine learning and natural-language skills to analyze and find trends in data from a wide variety of sources. IBM has been promoting Watson and its related technology as powerful tools that also can be used in retail and other industries. In addition to the company's client list and its data, IBM will be getting one more valuable asset with the Truven acquisition—talent—from epidemiologists to consultants, creating a “dream team” that “will bring our global footprint of talent to 5,000,” according to Dr. Kyu Rhee, chief health officer at IBM Watson Health. The Truven deal is expected to close later this year.